September has not been a great month. 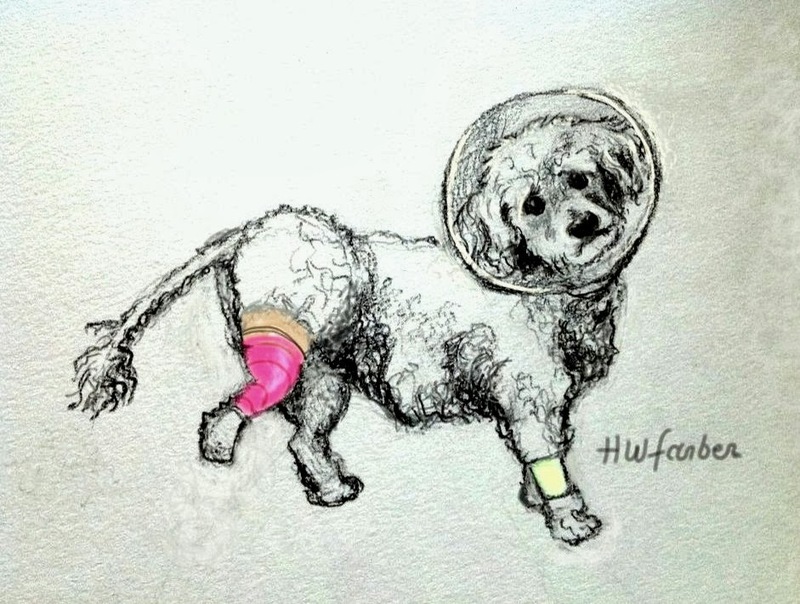 My six-year-old dog Willie ruptured a ligament in his right knee two weeks ago. During his weekly Thursday trash-night walk on the leash (his favorite activity), he jumped up onto a low wall, turned and screamed--I carried him home. After x-rays under sedation, he had surgery Tuesday and came home yesterday. I am his nurse, forcing pills down his throat; later I'll be his physical therapist. He is so sad--pink bandage covering stitches on the back leg, shaved upper leg, chartreuse bandage on the front from the IV, and the cone. He heard me taking the trash down tonight so I carried him to the street for a short two-and-a-half-legged walk in front of the house. 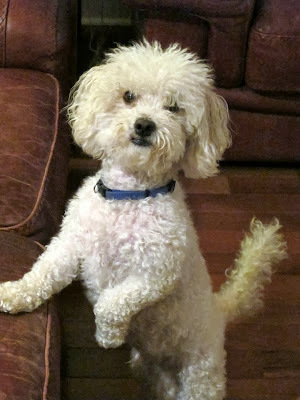 We thought Willie was lazy when he'd stare at us--waiting to be lifted onto the sofa; didn't know he had bad knees. I do realize that we are but specks in this world of floods, earthquakes, fires and mass killings. May everyone have better days. Poor Willie indeed! But I sure love the drawing of him and that oh so human look in his eyes. I hope he feels better sooner rather than later!! Thanks CrimsonLeaves. Sooner would be great. Our pets are an extension of our lives, I totally understand and wish you as nurse and Willie as patient for a speedy recovery. My dog Charlie loves running after squirrels in the park and it's the one time I let him off leash. Last week he ran to the usual spots and came out covered with burrs matted deep into his fur and the vet had to restrain and shave him. No more off leash for him. I guess we got off easy. Hallie, I meant to ask, have you ever used pro create for iPad? I recently met an artist who has done some amazing work using it and it made me think of you. Hi Robin. I know the burrs--these pictures show Willie with haircuts. I use Procreate when I'm creating the whole painting on the iPad. I use Sketchbook when I take a photo of something half-done and want to play around. They're both great apps. No matter what's hitting the fan, dogs are number 1. We send love to you and Willie. Thank you SamArtDog--I suspect September has not been a great month for you. Hope you were able to save some of your works and supplies (I think of those beautifully organized boxes of pastels). Oh Hallie. Poor poor Willie! I can only imagine how your heart ached over his pain. If only our fur kids could talk! Now that you know about his weak knees, you can plan accordingly. He's a doll baby. I love your drawing of him- the expression on his face is priceless. We are but specks- but it doesn't in any way mitigate the anxiety and worry over pain and hurt in the people and pets we love. Feel better... that's for you and Willie. Hi PAMO. Thanks for thinking of me; I'm hanging in there--someone has to carry Willie up and down the front porch stairs. The back door and deck would be easier but, as luck would have it, it just got repaired and reprinted--not quite dry. Willie has three operable legs now so he's getting around. He's made adjustments--he always made his marks with the left leg raised; now he has to turn around. We specks will be okay. Awww, it is ruff getting older. And we forget how fast dogs age. Did you know the glucosamine-condrotin stuff we humans take was first made for dogs? Maybe they would help. Hi Sue. I'm guessing this has something to do with Bichons--not age. Maybe I should use my CVS coupon for glucosamine for Willie. I'm enjoying you 30 paintings in 30 days. I am so sorry for your "Willie". He is such an handsome lad. I hope recovery will be quick. We do love our guileless friends that we have made during this time/journey upon planet earth. A few years back we lost our dear "Rose" (Boarder Collie). There will always be a place in my heart with happy memories of her. She helped us herd 200 (yes, 200) Araucana chickens. She knew when we were not feeling well by showing such tender closeness and "talking". She never once tread into the garden beds, always staying on the path. She never ventured beyond our property lines, yet always warned of an intruder. She knew how to tell us there was a snake close by. She communicated so well without having the ability to talk as we talk. I say all this to let you know that I understand the importance of Willie in your life. What a wonderful sketch that shows all your sympathy and love for him. Hi Steven. Your Rose must have been amazing--200 chickens?? Our dogs usually live to about 14, and they always break our hearts when we say goodbye. I think Willie is on the mend and should be around for quite a while--the worst was his moaning and crying when we brought him home the day after his surgery. I almost joined him in the moaning and crying. I like your recent drawings--so precise. Thank you for the comment. Hi Jane. It's Monday a.m. and Willie is much improved. I hope Willie feels better. You will make a great physical therapist. Your drawing really captured his discomfort. Hi lifeartist (Davida). I am one of those who almost passes out at the sight of blood and stitches. His bandage came off Friday and I try not to look--four days until stitches come out. Thanks Celeste. Willie is much better and we hope this doesn't happen to his other knee--or his elbows. Poor Willie is right! Poor Hallie too. It's no fun being nurse, especially when it comes to forcing pills down the patient's throat. Does Willie still need to wear the cone. A friend of mine's dog has never forgiven the vet for putting a cone over her head. I hope Willie mends and thrives with your care. Hi Carole. Poor Willie's still wearing the cone; it might come off when the stitches are removed Friday. He only looks miserable when I say "stay" while I get his medicine (his liquid antibiotic tastes terrible--I don't blame him). Hope YOU are feeling much better. Oh No! Poor, poor Willie. I hope he is doing much better. I love the sketch you did of him. He's adorable. I know about garbage night walks. Imagine the garbage in NYC. The dog I have now is not THAT bad with the garbage, but my other pup (a 100lb+ Rottie Shepherd mix) LOVED garbage night. She could spot a loose chicken bone from a mile away. And then I'd have to spend the night wrestling with her to get it out of her mouth. Luckily she was very gentle. One time she hurt her shoulder and I remember how painful it was for her. It's so hard when they can't tell us what's wrong. OK, I went on and on. Give Willie a nice belly rub for me. Thank you CarolKing. Willie enjoys his Thursday night walks--that's when he pretends to be a city dog on a leash. I don't think he's ever found any garbage treats but he likes to mark all the neighborhood utility poles. Usually he's in our fenced front yard; we put in a picket fence just for him. Yoooo Hooooo, Celeste. I'm still kicking, but not high.